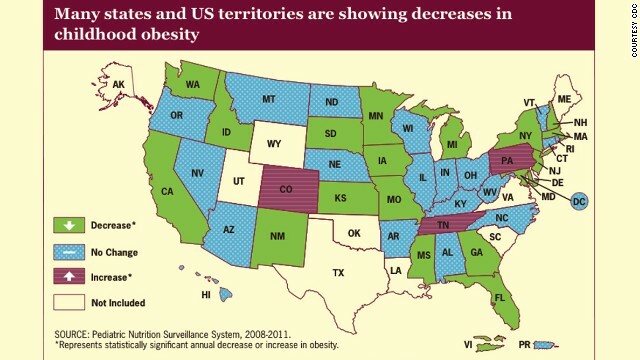 This map shows the states that experienced a decline or increase in low-income preschool obesity rates. After decades of warnings about the rapidly rising rate of childhood obesity, the Centers for Disease Control and Prevention has some good news. A new report from the CDC suggests we've made some progress in the fight against childhood obesity in the nation's youngest children - specifically those from low-income families. Researchers analyzed data from approximately 12 million children between the ages of 2 and 4 who participate in federally funded nutrition programs. Data from 40 states, Washington, the U.S. Virgin Islands and Puerto Rico were included in the Vital Signs report. Nineteen of the states and the U.S. Virgin Islands saw a small but significant decline in preschoolers' obesity rates between 2008 and 2011, according to the CDC. Three states - Colorado, Pennsylvania and Tennessee - saw a slight increase over the same time period, and the rest remained stagnant. Utah, Wyoming, Louisiana, Texas, Maine, Delaware, Alaska, Oklahoma, Virginia and South Carolina were not included in the report due to inconsistencies or changes in data reporting. "It's a bright spot for our nation's young kids, but the fight is very far from over," CDC Director Dr. Tom Frieden said. An estimated one out of every eight preschoolers in the United States is obese, according to the CDC report. The numbers are higher in African-American and Hispanic populations, at one in five and one in six, respectively. Children who are overweight or obese as preschoolers are five times more likely to be overweight or obese as adults, Frieden said. This can increase their risk for health problems such as cancer, heart disease, diabetes and stroke. Government initiatives such as the first lady's Let's Move! program have tried to encourage child-care providers to offer outside play opportunities, reduce screen time and serve fresh fruit and vegetables at every meal. They've also tried to eliminate fried foods and sugary drinks from young kids' diets. While the CDC cannot prove that programs like these are making a difference, Frieden said, it's obvious that something has changed. “Today’s announcement reaffirms my belief that together, we are making a real difference in helping kids across the country get a healthier start to life,” First Lady Michelle Obama said in a statement. Previous smaller studies have shown similar declines in other child populations, Frieden said, but this is the largest national data system that exists. He said the CDC is confident that the declines shown in these 19 states are a sign of a national downward trend. Obesity rates among low-income preschoolers steadily increased between 1990 and peaked in 2007 at close to 15%. They have since flatlined. This is the first sign of a turning point. Epígrafe 653.2.- Comercio al por menor de material y aparatos eléctricos, electrónicos, electrodomésticos y otros aparatos de uso doméstico accionados por otro tipo de energía distinta de la eléctrica, así como de muebles de cocina. Epígrafe 653.3.- Comercio al por menor de artículos de menaje, ferretería, adorno, regalo reclamo (incluyendo bisutería y pequeños electrodomésticos). Creating a good investment in the stock market is a thing many individuals is going to do at some time with their life time. You can find actions you can take for more information on the options, reduce your threat, produce a diversified collection and generally, commit with more self-confidence. Follow this advice that will help you to intelligently browse through the industry of the stock exchange. One of the ways that you can prevent candida albicans altogether is always to limit the alcoholic beverages absorption which you take in in the daytime and nighttime. Liquor can hurt your immunity process, and that is a essential aspect in combating the fungus that can bring about modest and severe candidiasis.